THE Wild Horse, Yasiel Puig, ran free at the SCG yesterday as the LA Dodgers held off the Arizona Diamondbacks to win game two of the historic season-opening MLB series 7-5. The victory gave the Dodgers, who have a total team salary of $A257 million, a 2-0 clean sweep of the Sydney experiment after taking game one 3-1 on Saturday night. And after more than 38,000 fans turned out to both games, outgoing MLB commissioner Bud Selig, who is set to step down from the post he has held since 1992 at the end of the season, predicted a bright future for the sport in Australia. Selig said he was most proud of expanding the game, with the historic venture to the SCG the seventh time since 1999 the MLB had taken regular season games overseas. "It won't be a one-off experiment," Selig said. "I'm proud of where the sport is, proud of its growth. Growth has been stunning since 1992. "I'm proud of the internal economic reformation of the game. All the marketing, all the things that didn't exist in 1992. "If somebody had told me back in 1992 we'd be where we are today, you couldn't have even conceded that." The enigmatic Puig certainly gave the fans plenty of value for money yesterday, producing three hits and two runs batted in, but was out twice after misjudging base runs. The 23-year-old Cuban's day finished early, leaving the game late with what looked like a bad back, although Dodgers manager Don Mattingly wasn't sure how serious the injury was. "He seems to grab something every time he plays. 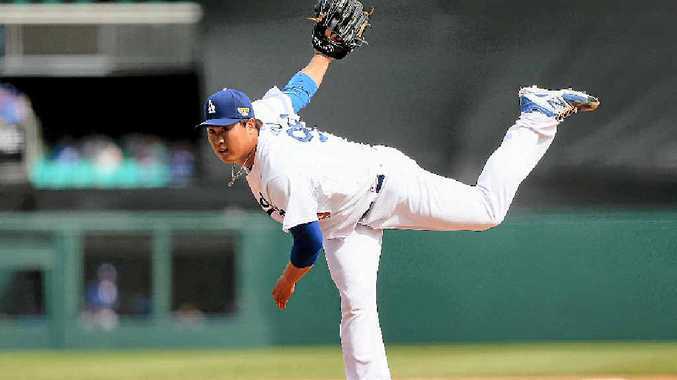 It's like the Boy Who Cried Wolf - we don't really know when he's injured," Mattingly joked. Paul Goldschmidt was one of the few shining lights for the Diamondbacks on the trip, which included a 5-0 loss to Team Australia on Friday night. Goldschmidt went 2/4 on his visits to the plate in Saturday night's loss, scoring his team's first run of the tour, and followed up with two hits from five times at bat yesterday. Despite not winning any of their games, two Diamondbacks players will leave Australia with fond memories. AJ Pollock proposed to his partner, and Jim Myers popped the question to his - during a climb on the Sydney Harbour Bridge.